Despite its large imposing size, the Mastiff is a calm dog that can be kept indoors! The Mastiff, also commonly know as the English Mastiff or Old English Mastiff, is a working breed. The Mastiffs are the oldest English dog breed. They were originally breed to bait bulls, bears and lions and used in dog fighting. Later they were used to guard for sheep, and then to serve as search and rescue dogs. Today they are popular as a pet, and as a guard and protector. As a pet, the English Mastiff temperament is calm and gentle. It loves to please and craves companionship. Mastiffs are wonderful protectors, keeping strangers at bay until it is apparent that they are welcome. They rarely need any training at all to make excellent guard dogs. Bravery and loyalty come naturally to them. Unfortunately, the Mastiff's massive size has made it a frequent target of breed bans. When choosing a Mastiff as a pet, check bloodlines for hip dysplasia and eye problems. Less common problems to look for include thyroid problems, heart problems and allergies. Breed Type The Mastiff is a working breed. Though once used in baiting and fighting, today's Mastiffs are natural guard dogs and good-natured companions. Background The Mastiff is known as the oldest British breed. Its lineage includes ancient breeds such as the Alaunt and the Molosser, and the Pugnaces Britanniae is its direct predecessor. The Mastiff is believed to have come to Britain as early as the sixth century BC. This imposing breed was once used in dog fighting and baiting of bears, bulls and lions. It went on to less violent pursuits, including guarding sheep and search and rescue, but to this day is popular as a guard and protector. The breed nearly died out by the end of World War II, but has since been reestablished. 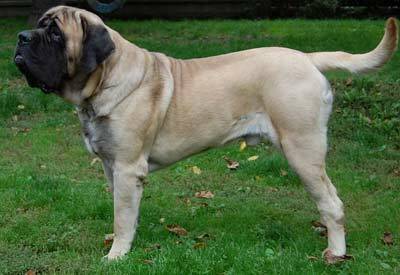 Description The Mastiff is a large and muscular breed. It has a large, squared head with a short muzzle, small, dark hazel eyes, and small, dark-colored ears. Its tail is long, high-set and tapering. The coat is short, and can be found in golden fawn, light fawn, brindle, silver, tiger and apricot. There should always be a black mask around the eyes and nose. Male Mastiffs are at least 30 inches tall and usually weigh around 160 pounds, although some have been reported to top 200 pounds. Females are 27 inches or taller and weigh about 150 pounds. Care and Feeding The diet of the English Mastiff should include plenty of fiber. Recommended components include beef, barley, oats, rye and potato. Little grooming is required for this breed. Mastiffs are prone to bloat, so feeding them two or three smaller meals rather than one large meal each day is a good preventative measure. Regular brushing and wiping with a towel are virtually all that is needed to keep the coat looking great. Baths should be given only when necessary. Sometimes an Old English Mastiff will have allergies, so added environmental maintenance may be necessary. They shed moderately, necessitating regular vacuuming. Housing Your Dog Although they are very large, the English Mastiff can be kept indoors with no problem due to their calm nature. They need a soft bed to sleep on in order to prevent calluses and joint problems. Social Behaviors Mastiffs do well with children, although they are not recommended for younger ones due to their strength and stature. Careful socialization is necessary to prevent aggression toward other dogs, and to prevent overprotectiveness in the presence of strangers. Handling and Training The Mastiff is an intelligent breed, but its willfulness may pose problems during training. Firm training with positive reinforcement can produce satisfactory results. Activities Mastiffs do not demand a great deal of exercise, but they need a substantial amount to keep them healthy. It is important, however, not to overwork them as puppies. A daily walk is recommended, and if your dog is to play off-leash, a fenced area is a must. Breeding/Reproduction When breeding your Mastiff, both mates should be tested for hip dysplasia, eye problems including PRA, thyroid disorders, and elbow problems. Care must be taken to prevent the puppies from being crushed or smothered. A whelping box can help protect them. Common Health Problems Mastiffs are prone to bloat, a condition caused by eating too much too quickly that is fatal if left untreated. It is important to know the signs and have your veterinarian's emergency number handy. Availability Mastiffs can be located in most areas. If you can't find a local breeder, check online. Prices are often over $1,000, and sometimes over $2,000. I've seen joint problems in Saint Bernards, it's uncomfortable for them. But I'm not sure when it's best to start joint guard, I bet your veterinarian could give you some good advice on that. Our Mastiff is a gentle giant and I highly recommend it for a pet. He is 10 years old and is getting to be very old. If you get an english Mastiff I suggest You have a vet take a look at his eyes and hips for cataracts and hip dysplasia. If my Mastiff gets sores on his legs what do you recommend we do to take care of his legs. WOW hard to know. Why sores - I think I would just ask the vet. Is something itching him so he is chewing on his legs? Does he have a dry skin or any skin condition? Could he possibly be allergic to something? It is like if one of us humans gets a sore - what caused it and then you can treat it. Possibly (and i hope) that yours never does get sores. my mastiff is 7 and he also has a sore on his back leg that will not heal. I have been putting Vaseline and antibiotic ointment on it with no luck. he is also chewing on his paws and legs and is losing hair. I think he is allergic to the carpet freshener I used to help with the odor he leaves in living room. We use Desitin (a baby cream with fish oil) for human and animal sores. It's about the best product I know about for sores. I think that if an animal can reach to lick it, you should try to cover it. We own two mastiffs,both are house dogs.Thay are one of the gentlest large breeds that we have found.Love to play with they grandchildren and will protact them at the same time.Bast baby setter I've found ! I love them; they're very theraputic and gentle. I only wish my friend would get another one for the rental they're in because they take care of my autistic daughter who LOVES mastiffs and all even-tempered dogs. I have an English Mastiff named Rollo. He is in perfect health and temperament. When I purchased him the owners were to provide me with his family history but failed to do so and is no longer around. What would the steps be to get him to be the first family line. Is there special things to do with the English Mastiff Association? Thanks. If registered you may be able to track back with old owners name.